"And yet, still you fail." The New Phoenix Incident, or the Fall of New Phoenix, was an engagement fought between the UNSC and the Ur-Didact and his Promethean forces in close proximity to Earth on July 25, 2557. John-117 and Cortana inside the Broadsword Fighter assaulting the Didact's ship. Having retrieved the Composer from Ivanoff Station, the Didact set out to attack Earth in his ship, Mantle's Approach. The Didact was unaware, however, that John-117 and Cortana, in a Broadsword fighter, had managed to breach the ship's shields and make the slipspace journey along with it. As the ship emerged near Earth, the UNSC Home Fleet was mustered in Earth's defense; including the UNSC Infinity, now under the command of Thomas Lasky. Despite this preparation, the fleet's efforts were rendered useless by the advanced technology of the Didact's ship. Earth's orbital defense grid went into Red Alert, but even the Orbital Defense Platforms proved ineffective. 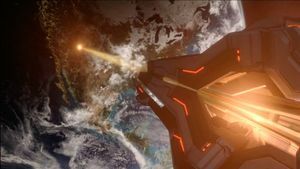 Hunting for the Composer aboard Mantle's Approach, John-117 and Cortana proceeded to destroy the turrets defending the ship's main weapon, allowing the Infinity to fire upon the Didact's ship to open a hole for the Master Chief's Broadsword. However, the interior defenses made the passage too narrow for the fighter to pass through and caused it to crash, forcing the Chief and Cortana to carry their HAVOK payload to the Composer on foot. Infinity engaging the Mantle's Approach. As John-117 and Cortana reached the Composer, the Didact activated the device, composing seven million people in New Phoenix, a major population center in North America. After fighting past significant opposition from the Prometheans, the Master Chief was able to approach the center structure, only to be ambushed by the Didact. During the struggle, Cortana was able to manipulate the hard light bridge on which the Didact stood, trapping him. This bought the Master Chief enough time to activate a pulse grenade and plant it on the Didact's armor. The resulting explosion knocked the Didact off balance and sent him falling into a slipspace rupture underneath the Composer. As Master Chief activated the HAVOK tactical nuclear weapon, Cortana was able to translocate the Spartan a safe distance away from the blast. The majority of Cortana's processes remained aboard Mantle's Approach, and were presumably destroyed in the nuclear blast. She maintained herself long enough to bid farewell to the Spartan inside a box of hard light she had generated somewhere outside the immediate blast radius. Master Chief was found by a Pelican floating among the debris and was returned to the Infinity. Due to uncertainty over the finality of the Didact's defeat, the UNSC Security Council decided to hide the details of the attack from the public, concealing it as an attack by the Covenant remnants stopped by the return of humanity's greatest hero, the Master Chief. Additionally, the Office of Naval Intelligence quarantined New Phoenix for a year. Six months later, however, ONI public relations officer John Sullivan released a statement to the press confirming the Covenant were not responsible for the attack. The UNSC leadership's doubts about the Didact's "death" were not unfounded; the Promethean general had actually survived his fall into the Composer's slipspace rupture. The portal took him to the vicinity of the Composer's Abyss on Installation 03, where he slaughtered Spartan Black Team. Allying himself with monitor 859 Static Carillon, the Didact then traveled to the Composer's Forge through a portal in the Composer's Abyss, intending to acquire new Composers and other instruments for his crusade against humankind. John-117 and Blue Team were deployed to Gamma Halo immediately after the massacre and confronted the Didact in the Composer's Forge. Although their confrontation with the Didact proved perilous and nearly fatal, the Spartans eventually managed, with the aid of Static Carillon (who turned on the Didact after the latter broke an agreement between them), to "contain" the Didact as a threat. During the Requiem Campaign, the UNSC Infinity recovered a Forerunner Durance called the Didact's Gift from the Covenant. The device, said to contain the "soul" of a Promethean Knight, revealed images of New Phoenix during the attack, indicating that the consciousnesses of the composed New Phoenix residents had been transferred back to Requiem and converted into new Prometheans. Adding to the mystery, the images also revealed that another Forerunner artifact had been present in New Phoenix during the attack. On March 24, 2558, eight months after the battle, the city's quarantine was lifted. A "Rebirth" ceremony was held in the city, presided over by UEG President Ruth Charet. Infinity firing her fore weapons. The Composer is used on Earth. John-117 and the Ur-Didact fighting aboard Mantle's Approach. Gabriel Thorne having a nightmare of New Phoenix's population being composed. ↑ Once Earth comes into view, it can be seen that the Eastern and Central Time Zones of the United States are in sunlight, while the Pacific is in darkness. The sunlight is just cresting at New Phoenix, indicating that it is sunrise in the Mountain Time Zone region. This would occur around 5:40 AM in late July, which corresponds to 12:40 PM UTC.